Bashlin Aluminum climbers combined with Buckingham Metal Insert Hook-N-Loop Cinch pads. Bashlin’s BD14 series aluminum climbers are constructed of 2014T6 aluminum alloy. Designed as a light weight alternative to steel, this climber reduces weight by as much as 30%. Note: The aluminum alloy construction sacrifices some wearing qualities. This climber is a favorite of many. This climber is designed with a non-contoured shank. This fits the climber shank flush against your leg and positions your feet closer to the pole. 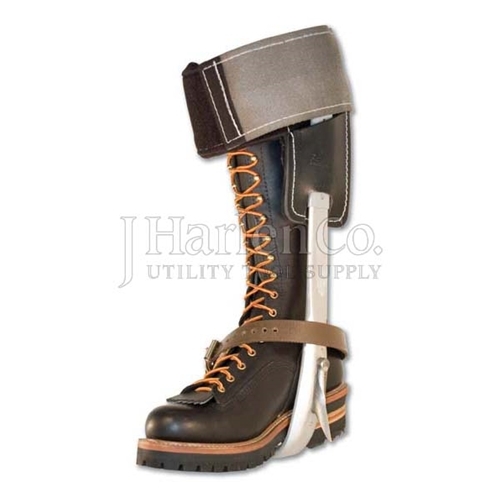 The BD14 features an offset stirrup. This positions the stirrup closer to the center of the foot by offsetting the stirrup forward of the shank. The included ankle straps are permanently attached to a steel triangle, hinged from an eyelet on the stirrup. Replacement strap are assembled into place. Bashlin’s aluminum climbers come standard with the number 14 set-screw replaceable gaffs. These gaffs measure 1-5/8”. Replacements can be ordered in a polished model for use on CCA or hard poles (part no 14P). The Buckingham 3502C hook-n-loop pads are 4" wide and feature an angled metal insert for extra support and climber positioning. The thick padding adds all-day comfort. Nylon bottom straps, gaff guards, and gaff gauge included. Boots not included. For display purpose only.